Malabi, a photo by Tom lahat on Flickr. If Sahleb is the royal treat of winter, then the rosy, rubbery Malabi (see recipe below) is the queen of summer in the Middle East. 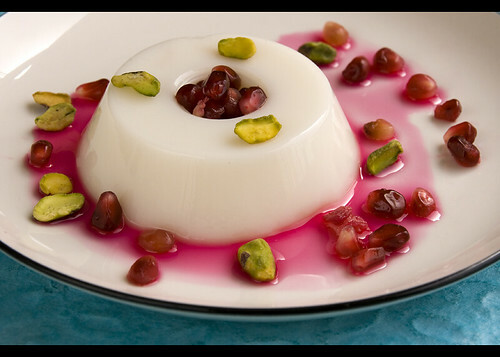 Served cold in every other corner and almost every kiosk and restaurant of any caliber, this chilled milk-pudding captures the eye with the contrasting rosy-red syrup oozing all over the white, petri-plate-like to-go containers it comes in. I was never a big fan of its texture (ditto in regards to Rahat Loukum, also unjustly made with corn starch instead of better quality materials), but I adore its fragrance! What always captures my imagination about malabi was its soft, evocatively sounding name, and its unique fragrant combination of rosewater and neroli. Rose and neroli are such noble flowers yet oh so different. Rose is open, voluptuous, sweet and feminine. Neroli is prim and proper, restrained, clean, ethereal and otherworldly. It's incredible that such a thing even grows from the earth, as has such a heavenly character. Malabi with pom syrup, a photo by Dan Bar Dov on Flickr. The balance of these two strong-willed floral elements that inspired the creation of my new, limited edition for Valentine's Day 2014. Titled Musk Malabi, this perfume is a holy triad of sorts, between voluptuous, velvety and soft rose; airy, clean and cerebral neroli, and the pulsating animalic energy of musk. The musk is, in a most profound way, what makes these two oppositional flowers harmonize rather than compete with one another. It is told in the Koran that Mohammed's breath was as sweet as rose, and that he considered musk to be the purest of all perfumes. Musk grains were even mixed with the mortar in the construction of several Eastern mosques and retained their musky scent for years. The botanical musk in Musk Malabi was designed to smell as close as possible to deer musk, and most importantly, act like one: it plays cupid pulling all the strings between and drawing the lovers (rose and neroli) together. It doesn't need arrows, and plays the harp better than cupid, doing all of this work gently and with effortless fluidity. Malabi, a photo by shai.wininger on Flickr. Musk Malabi is a limited edition for Valentine's Day 2014, which is just a month away from today! Love it, and it will love you back. Beautiful! I just know it! I just wanted to come out of lurking-- I am a natural perfumer and have been following your blog for a few months. I truly admire your creative spirit and the trove of information you have to offer! Thanks for sharing your experience and thoughts. 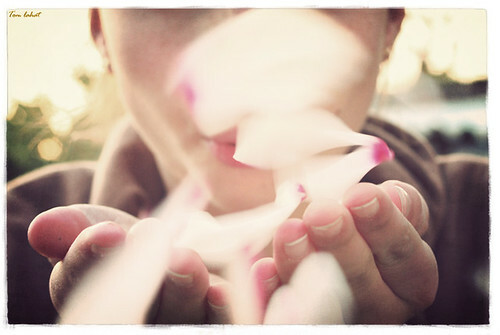 And, I plan to try your perfumes soon!